Recently I was surprised to discover that I hadn't posted a new pasta recipe since last September (!). 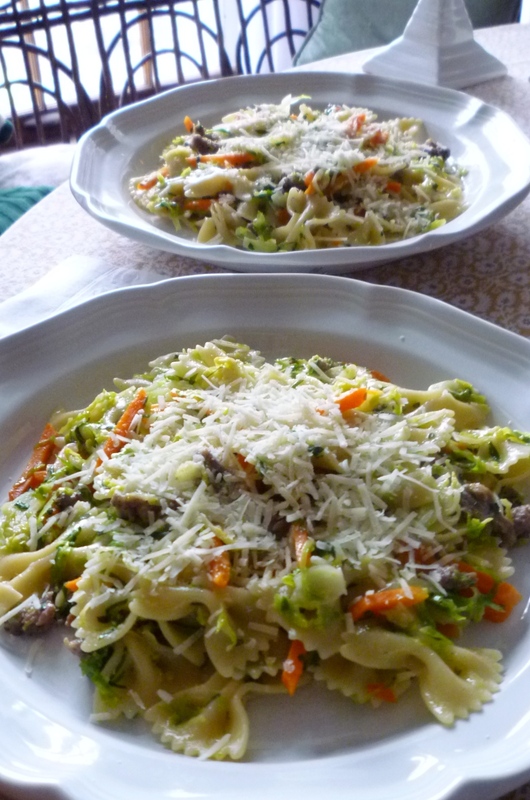 To end the drought I thought I would share a recipe for a pasta that we had for the first time this past winter...and that we have enjoyed several times over the course of the season. This particular dish was born of the intersection of the need to get dinner on the table quickly with the spare contents of my pantry. To be honest, this situation isn't as rare as I would like. Occasionally the results can be less than stellar.... But on this occasion, the results were delicious....and definitely worth repeating. It has been a while since I first made the dish, so my memory of the particulars of how this dish came to be is a bit fuzzy. But even so, I'm confident I can recount the process fairly accurately. 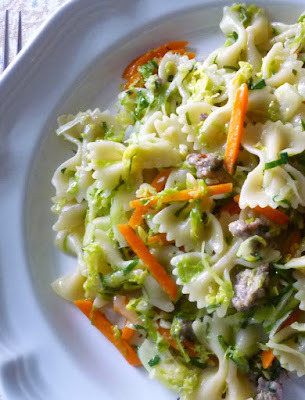 The Brussels sprouts in my vegetable bin and the sausage in my freezer would have put me in mind of an unusual cabbage and sausage pasta that I enjoy. I probably settled on making that dish (or something similar)...just replacing the cabbage with the sprouts...before I discovered that I didn't really have enough of the sprouts. But having begun, I decided to forge ahead. I also happened to have some carrots and shallots (they are pretty standard items in my winter pantry....), so I decided to extend the sprouts with these. This combination might sound far-fetched, but it really isn't. The sweetness of the carrots and shallots plays very nicely with the pleasant bitterness of Brussels sprouts. (I like this combination enough that I have posted it before in a vegetable ragout.) The final pasta dish...with its subtle interplay of bitter and sweet with the salty sausage...hits all the right notes....and has continued to do so every time I have made it. Of course I hope that people who read this post will try this particular pasta... But I also hope that people will feel inspired anew to create and cook a meal on a night when they didn't think they had anything in the house to cook with. Anyone who cooks on a regular basis can do this...particularly if you start out with a blank canvas as friendly and amenable as pasta. The trick for preparing a good "sauce" lies in using good technique (something I strive to address with every blog post)...and in combining ingredients in a way that makes sense. 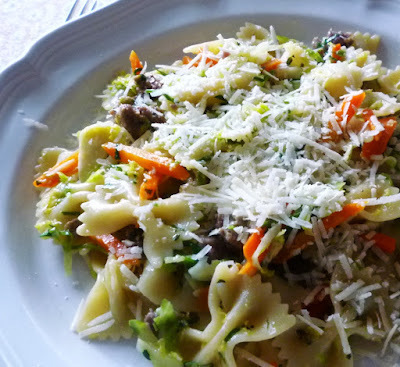 There were probably other vegetables in my produce drawer on the day when I first made this pasta...but as I describe above, I selected the ones I did in view of how they would interact with one another. The process isn't difficult...it just takes practice...and restraint. I suppose I should offer a bit of an apology for posting a winter dish now that spring has arrived.... I really ought to be posting something featuring asparagus...or peas...or radishes... But there will be time enough for that in the days to come. For now, before winter has entirely faded into distant memory, I wanted to be sure and record this pasta so that next winter...when the contents of my pantry have dwindled to a handful of Brussels sprouts, a couple of carrots and a frozen sausage...I will know exactly what to make for dinner. Place the olive oil in a large sauté pan. Crumble in the sausage. Set over medium heat. Cook the sausage, stirring occasionally, until it has lost its pinkness. Using a slotted spoon, transfer to a plate. Add a half tablespoon of butter to the pan along with the shallots, carrots and a pinch of salt. Cook until just softened...about 5 to 6 minutes. Add the thyme and fennel and cook until fragrant...about a minute. Add the sprouts along with a pinch of salt, tossing to coat the sprouts in the fat. Add a splash of water (2 to 4 T.), reduce the heat, cover and cook gently until the sprouts are just tender...about 5 to 7 minutes. Toss in the sausage and set aside in a warm spot while you cook the pasta. Drop the pasta into a pot of boiling, well-salted water and cook until al dente. Scoop out a half cup or so of the pasta cooking water and reserve. 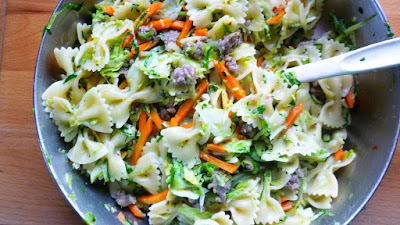 Drain the pasta and add to the pan with the vegetables along with the parsley and a tablespoon of butter. Place the pan over very low heat and toss to combine...adding pasta water (and more butter, if you like) as necessary to moisten the pasta. Taste and correct the seasoning. Serve, passing Parmesan separately. Serves 2 generously. Note: This recipe is easily doubled. Make sure you choose a sauté pan large enough to accommodate all of the vegetables. If your pan is not large enough to accommodate the pasta too, simply toss the vegetables and pasta together in the pot the pasta was cooked in. To do this, drain the pasta and return the pasta to the warm pot. 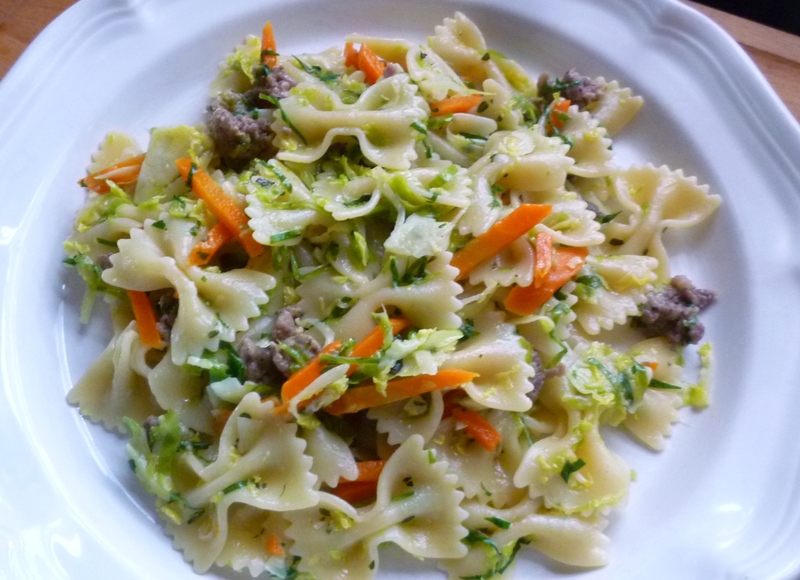 Use a rubber spatula to scrape the vegetable and sausage mixture into the pot with the pasta. Proceed as directed in the recipe. OMG! Eating it now and it is fantastic!!! Best dinner in over a week. Everyone should make it NOW and eat it. Not to be missed. Thank you Jennifer! I'm so glad you made this...are enjoying it...and want others to make it too. Thanks for taking the time to let me know.